three + 8 = Required Please enter the correct value. The crude oil price today whipsawed after four oil leaders reached an agreement to freeze production. The fluctuation in prices shows investors don't think the freeze will ease the supply glut. Why Is Crude Oil Down to $29.56 Today? Will Brent Crude Oil Prices Rebound from the "Black Monday" Crash? Crude oil prices today rebounded from yesterday's 13-year lows following an announcement that OPEC is considering an output cut. But there's one non-OPEC country that will have a huge influence on whether or not the cartel actually lowers output. Oil prices and the stock market are in lockstep right now. The correlation between Brent crude oil prices and the S&P 500 is at its highest level since 1990. Crude oil prices today fell in the wake of the deadly East Coast blizzard over the weekend. But don't let today's decline scare you away from the energy sector's profit potential. Crude oil prices plummeted below the critical $30 mark today as investors remain concerned over Iran's oil operations. Today's monster sell-off comes ahead of a report from the IAEA on the state of Iran's nuclear program. 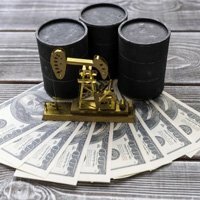 Why oil is up today (Monday, Nov. 23): WTI crude oil prices gained 0.7% this morning following a bullish announcement from Saudi Arabia. The gains came after Saudi Arabia announced it's ready to cooperate with both OPEC and non-OPEC members to stabilize oil prices. Oil prices today (Friday) moved higher on yesterday's FOMC minutes and the ongoing Syrian conflict. Today's rise puts prices on track for the biggest weekly gain in more than six years. Brent crude oil prices today increased for the fourth consecutive session despite the EIA's bearish supply report. The agency reported oil supplies increased by 3.1 million barrels last week. The news could worry traders who think supply will keep building up. WTI crude oil prices slumped today after the release of a new Goldman Sachs Group Inc. (NYSE: GS) price forecast. The Wall Street bank cut its 2016 estimate for WTI prices, citing OPEC production and slow demand. Why are gas prices so low right now? The average price of regular unleaded is hovering around $2.40 a gallon - almost a dollar less compared to a year ago. WTI crude oil prices today fell deeper into negative territory following a weak trading report in China. China's imports and exports fell significantly in August, marking the second consecutive monthly decline. Crude oil prices today fell below $44 a barrel in response to a new weekly inventory report from the EIA. Despite the oversupplied oil market, there are still plenty of ways to profit from the energy sector. WTI crude oil prices skyrocketed today amid EIA's bullish supply report and OPEC's worries over low oil prices. The U.S. benchmark settled at its highest level since July 21. The Brent crude oil price surged today as stock markets rallied for the second consecutive trading session. The Dow Jones, S&P 500, and Shanghai Index saw huge gains following yesterday's historic rebound. Brent crude oil prices slid into a free fall this morning and hit their lowest level in more than six years. The plunge came on historic declines in U.S. and Chinese stock markets as "Black Monday" ravages the financial world.